"National Space Agency (ANGKASA) under Ministry of Science, Technology & Innovation (MOSTI) has organized a beneficial space program that require student to design, build and launch a nano-scale satellite by using a helium tethered balloon at the altitude of 150 meter." The nano-scale satellite which has all the necessary subsystems of a commercial satellite will be fit into a standard 325ml soda can. 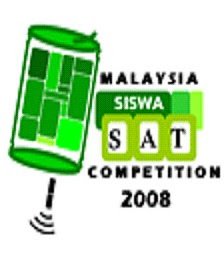 Multimedia University SiswaSat 2007 team with their “MMUSat Weather Monitoring System” won the second place in the previous competition and won RM3000. 1. The current competition is opened to all educational institutions and the previous competition in 2007 was only opened to Universities in Klang Valley. 2. An extra requirement of providing SiswaSat altitude during descending in at least 5 seconds interval. 3. An extra requirement of SiswaSat power to withstand at least 20 minutes. 4. An extra requirement of a graphical user-friendly ground station software. 5. An extra document "Proposal of mission" is required for the preliminary elimination. 6. An extra document "Flight Readiness Review" is required prior to the launching. 7. Post-flight presentation 1 day after the launching. It was in the same day in previous competition. 8. In the competition criteria and guidelines document, the altitude mentioned in introduction is 200m. It was 150m in previous competition. A higher altitude will definitely give longer duration of descending. 9. More prizes are given. Beside the usual first, second and third prize, the competition also has Best Design, Best Mission and Best Team. Dr. Mohamad Yusoff Alias and Mr. Yap Wen Jiun, the faculty adviser of previous MMU SiswaSat team will remain as this year SiswaSat team faculty adviser. Mr. Pavithran Nair and Mr. Soon Jun Sheng, the member of previous MMU SiswaSat team will become the senior members this time. 4 more members will be recruited from the interview session on 10 July 2008 in Faculty of Engineering. The call for interview is published in MMU online Bulletin Board.